West Jakarta Water Resources Sub-dept. is looking to repair the damaged IPAL outlet sheet pile and jogging track of Grogol Reservoir, Petamburan.
" The damage is about 3 meters long with 2.5 meters deep. 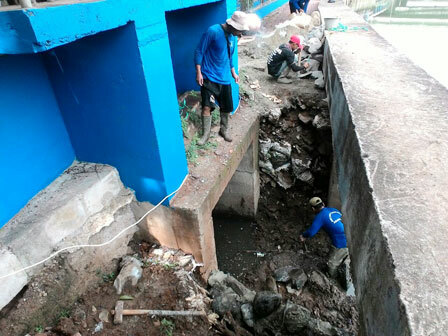 Until now, repair is still ongoing"
Juniarto, Section Head of West Jakarta Water Resources Sub-dept. said, the damage is due to the scouring of water coming out from the IPAL pipes into Grogol Reservoir. "The damage is about 3 meters long with 2.5 meters deep. Until now, repair is still ongoing," he told, Wednesday (11/8). He explains three days are needed to install river rocks on the sheet pile. If it is combined with repair of jogging track, it will take about two weeks. "It's targeted to be finished two weeks," he clo sed.